A "Left-Right Alliance" Against Public Sector Unions? Consumer advocate and left-wing activist Ralph Nadar has just written a book entitled “Unstoppable: The Emerging Left-Right Alliance to Dismantle the Corporate State.” In a Salon interview published on May 2, Nadar lists five areas where the left and right can agree on policy goals: (1) controlling security state overreach, (2) eliminating corporate welfare, (3) fighting military overspending and waste, (4) cracking down on Wall Street financial fraud, and (5) revisiting international agreements that undermine American sovereignty. (1) Charter schools: California’s public schools have failed millions of students. Charter schools, unconstrained by union work rules, have become laboratories of innovation. They have consistently delivered better educational outcomes at lower cost. Their proliferation should be encouraged. (2) Pension reform: California’s cities, counties and state agencies now face unfunded pension liabilities that – depending on what assumptions you make – total between $200 and $500 billion. Annual pension contributions now consume as much as 25% of the general fund budget in major cities. Reform is vital. (3) Transparency: Closed door negotiations enable sweetheart deals between policymakers and public sector union leaders; these secret negotiations also occur between policymakers and government contractors. Open negotiations allow citizen watchdogs early warning and prevent corruption. They should be mandatory. Enacting these reforms and others requires taking on the immense political power of public sector unions. The prerogatives of unions, embattled in the private sector, are sacred to liberals, and to some extent perhaps they should be. But public sector unions are fundamentally different from private sector unions. Their goals are inherently in conflict with the public interest. They have no natural checks on their power because they elect their own bosses, and, unlike unions in the private sector, their survival is not dependent on the financial health of a competitive company. And because their members enforce the law, approve permit applications, conduct inspections, etc., they have a coercive power over the business community that co-opts it. Finally, public sector unions enrich the very bankers they rhetorically demonize, because their bloated payrolls and overbuilt government agencies – the measure of their success – cause deficits that earn billions for bond underwriters. Similarly, their over-generous pension funds pour hundreds of billions each year directly into Wall Street investment firms. These monopolistic vested interests – public sector unions, large corporations, and the financial sector – share a common agenda to squelch competition and increase the cost of living for the rest of America. Only a left-right coalition can hope to counter their power. For the left and the right to unite on these critical issues, they have to acknowledge what Ralph Nadar and Patrick Buchanan have realized – partisan lines in America are blurring. The simplistic polarity of right vs. left is a myth. Why else would the increasingly authoritarian, corporatist status-quo be something that public sector unions have just as much interest in preserving as multi-national corporations? The “left” must stand up to public sector unions. The “right” must stand up to crony capitalists. They must work together. In the recent Salon interview, Nadar said “the most manipulated voter is a single-issue voter.” He’s right. In order to work together on issues of fundamental importance, whether they are regional issues here in California, or issues that face the entire nation, both sides will have to accept that their incongruous partners still bitterly oppose many of their most cherished ideals. Across the United States there is an escalating political conflict over the role of labor unions in society. But it is inaccurate to characterize this conflict as one between Republicans and Democrats. There are members of both major political parties, as well as independents of widely diverse ideologies, who are concerned about civil liberties, the growth of authoritarian government, inadequate investment in infrastructure, and poorly funded social programs. Explaining to these diverse groups that public sector unions are a threat to civil liberties, impel authoritarian government, and preclude investment in infrastructure and social programs – and that by and large, private sector unions do not – is the key to successful public sector union reform. (1) Public unions elect their own bosses, private unions have minimal role in selecting their management. (2) Unlike private unions, public union members run government agencies, which gives them the ability to intimidate their opponents with state-sanctioned force. (3) Public unions derive their revenue from compulsory taxation, private unions depend on consumers voluntarily purchasing products and services. (4) There is a trade-off between infrastructure spending that benefits private unions, vs. more pay and benefits for unionized government workers. (5) Public unions and Wall Street financial interests benefit when public entities borrow money and enhance pension benefits, since financial firms underwrite the bonds and invest the pension funds. Private unions have no similar conflict of interests. (6) Unlike private unions, public unions have an incentive to enact more laws even at the expense of civil liberties and economic growth, because it grows their organizations. Unlike public unions representing teachers, police, and firefighters — construction unions provide no job guarantees. There is no tenure or seniority. Our layoff process rarely involves any subsequent arbitration. Workers understand that their jobs depend upon performance and the availability of work. How much notice must the employer give a union construction worker before layoff? Fifteen minutes. Imagine if public sector unions had to work under these rules. Job security would be based on job performance rather than seniority. And as for retirement security, why should members of construction unions oppose public sector pension reform? The retirement plans that benefit unionized private sector workers must conform to ERISA (ref. “Actuarial Assumptions and Methods), meaning their pensions are modest but sustainable, because they have to use conservative rates of return when calculating the present value of their future pension payment liabilities. It’s not just more efficient work rules and sustainable pensions that differentiate unionized government workers from private union workers, however. It is the profound difference in overall incentives that drive each of them. Public sector unions want more tax revenue for themselves. Private sector unions want that money for infrastructure. And funding infrastructure remains a pipe dream as long as public sector unions successfully resist streamlining and modernizing government, and prioritize allocating tax revenue to more compensation and benefits. The agenda of private unions for infrastructure – real infrastructure, by the way, not environmentally correct useless monstrosities such as California’s “bullet train” and delta tunnels – is matched by the agenda of liberal Democrats for social programs. There will never be adequate money for either, as long as every spare dime goes to pay public employees literally twice as much, on average, as private sector workers earn. Where the interests of liberal Democrats and libertarian Republicans may intersect is depicted on the table below. 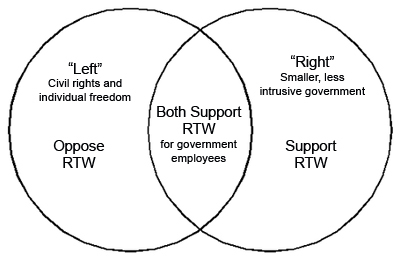 As shown, the “left” may oppose a union reform such as Right-to-Work (RTW) in the private sector, but for the public sector, they may view it as the only way to rescue their ambitious agenda for infrastructure projects and social programs. The “right” may support Right-to-Work for all unions, but will recognize that the most egregious threat to economic health and property rights comes from the government unions, who might be diminished if they were subjected to Right-to-Work laws. Another area of intersection between liberal Democrats and libertarian Republicans would concern the special case of public safety unions. Despite troubling nationwide examples of how public safety unions use their immense power at the local level to negotiate unaffordable compensation and intimidate political opponents (ref. “Battle over police pensions in U.S. cities takes ugly turn,” Reuters, January 2014), Republicans have exempted public safety unions from public sector union reform legislation. Their omission, from Wisconsin to Pennsylvania and elsewhere, not only leaves intact what are perhaps the most inappropriate types of public sector unions, but precludes an alliance with reform-minded liberal Democrats. Finally, a coalition of liberal Democrats and libertarian Republicans may jointly recognize that public sector unions are partners with Wall Street speculators and middlemen; entities who contribute nothing to the productive economy. For years, bond underwriters and hedge funds alike have had union controlled cities and states – and their public employee pension funds – as their biggest customers, and both reap short-term gain from accumulation of bond debt and unfunded pension liabilities that will eventually wreak financial catastrophe – that process has already begun. Liberal Democrats and libertarian Republicans will never agree on the optimal size of government. But they can recognize together that public sector unions are the force behind an inefficient, over-built, over-compensated, increasingly authoritarian government that violates the spirit and diminishes the potential of the American dream, in all of its diversity.